USB offers a potential alternative to the limited bandwidth of GigE but is unfortunately limited to short lengths. A solution to this dilemma is the IC USB 3 to 10 GigE software converter. A mini PC (e.g. 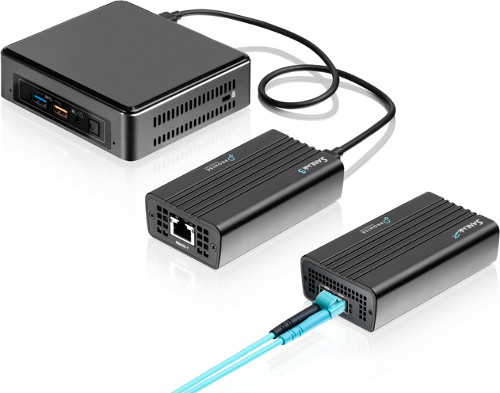 Intel NUC) is connected to a high-resolution USB 3 camera which via software functions as a converter - transmitting image data from the USB 3 camera to a 10 GigE interface. The attached camera can then be controlled by any PC with a 10 GigE interface as a regular GigE Vision camera. Photo above is for illustration purposes only. The hardware described above is commonly available, standard hardware.